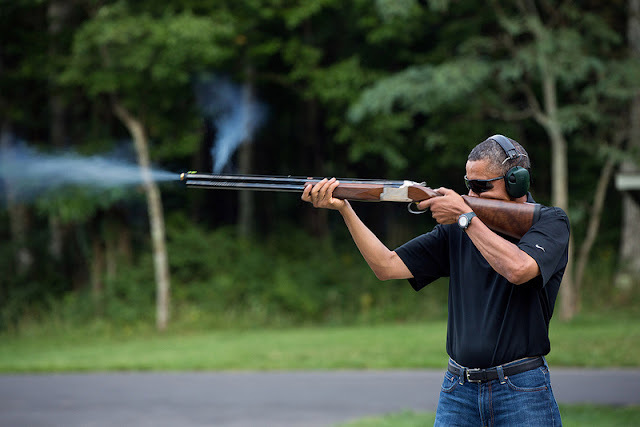 In this photo, President Obama is discharging a shotgun and is wearing proper eye and hearing protection. He's sighting the shotgun properly and has decent form, so we can assume that he's had lessons or has been practicing. On an email to the Washington Times, Travis Hall (CEO of Browning) identified the shotgun as a Browning Citori. He described it as possibly a Citori 625 Sporting Golden Clays, adjustable comb, left hand, in 12 gauge retailing for $4,799.